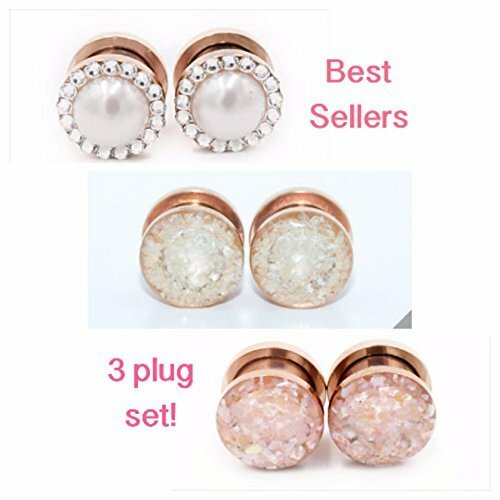 Set of 3 Rose Gold Plugs / 6g, 4g, 2g, 0g, 00g, 1/2, 9/16, 5/8, 11/16, 3/4 / Pearl Crystal Plugs / Champagne Rose Plugs / Plug Set by Defiant Jewelry at Nicky's Blog. Hurry! Limited time offer. Offer valid only while supplies last. Get a set of 3 pairs of our best selling plugs!!! - Pearl and Crystal Intricate - Pearl Crushed Glass - Champagne Rose Crushed Shell Save $25!!! Get a set of 3 pairs of our best selling plugs!!! - Pearl and Crystal Intricate - Pearl Crushed Glass - Champagne Rose Crushed Shell Save $25!!! (Normally $88 when purchased separately!) All plugs are high quality handmade - For the pearI and crystal pair, I hand pick and hand place each pearl & crystal - it has a large pearl in the middle with smaller crystals around the edges. The crystals make these very eye catching and sparkle like a diamond! All the pearls are secured to make them very durable and sturdy, so no having to worry about a piece falling off! Sizes available for this trio are 6g (4mm), 4g( 5mm), 2g (6mm), 0g (8mm), 00g (10mm), 1/2 inch (12mm), 9/16 inch (14mm), 5/8 inch (16mm), 11/16 inch (18mm) and 3/4 inch (19mm). ********************************************************************** Customize with your favorite base color! - Silver, Gold, Rose Gold, Black or Bronze If you want a different base color for each pair, please include what base color for which plugs in the notes section at checkout. Silver is a high grade 316L surgical steel - all other colors are an anodized titanium on high grade 316L surgical steel. ********************************************************************** If you need a different size then listed please contact me and I will do my best to accommodate. If you have any questions about this product by Defiant Jewelry, contact us by completing and submitting the form below. If you are looking for a specif part number, please include it with your message.